How To Make Delicious Kimchi At Home Easily? Don't Miss Out! 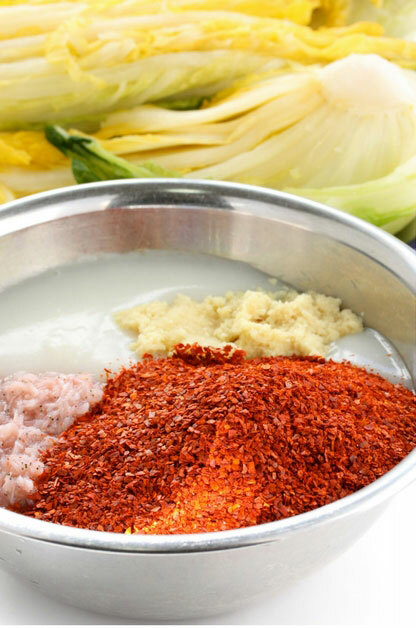 →How To Make Delicious Kimchi At Home Easily? This is a Korean dish made up of vegetables, ginger, garlic, salt, chili peppers, and fish. The mixture is fermented and pickled. This helps to preserve the vegetables. Kimchi recipes vary from one region to another. The flavor of Kimchi is complex. It varies from one recipe to another. Some of the main flavors are spicy, umami, and sour. The salt, length of fermentation, and vegetables will determine the flavor of your kimchi. The sour flavor is prominent because the Kimchi is fermented. Lactic acid is produced during the fermentation process. This gives the dish a flavor that is pungent and tangy. The flavor is similar to that of kraut. The spiciness of Kimchi depends on the red peppers. It can be mild or very spicy. Red peppers also give the dish the red color. The fish flavor most recipes have some fish product. It can be fish sauce, fish paste that is fermented, or anchovies. The fish product will give the Kimchi the umami flavor. Any recipe without fish will have a taste that is fresh and lighter. Kimchi taste can be sweet or salty. This is determined by the amount of sugar or salt used. You can make it too sweet or salty. The garlic flavor is very strong in Kimchi dish. The flavor intensifies as you ferment the mixture. 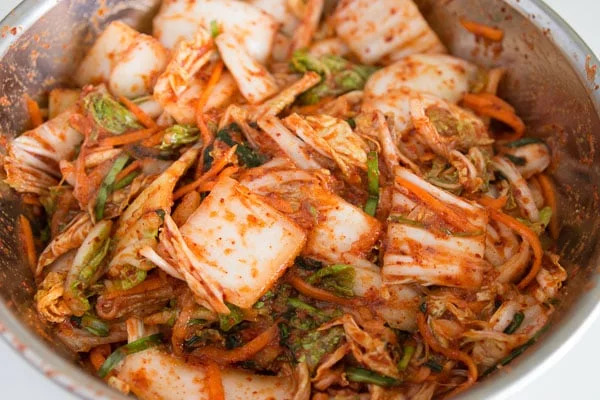 The vegetables used in a recipe can alter the flavor of your Kimchi. 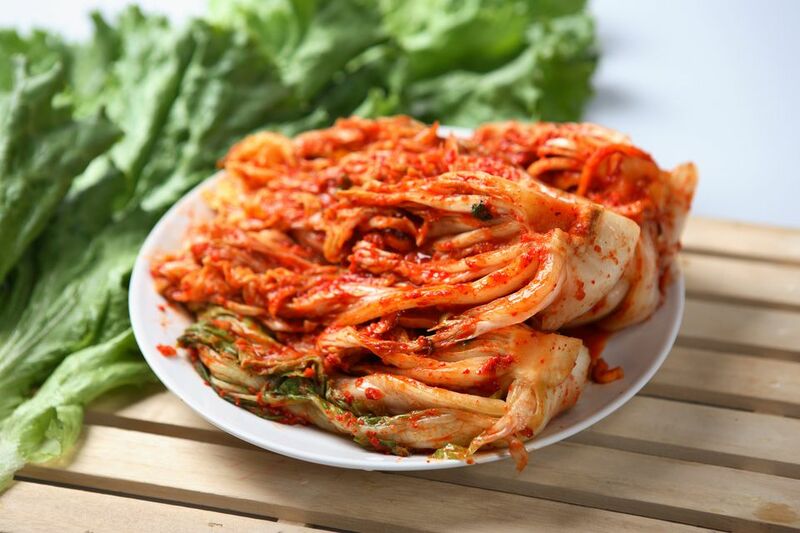 The cabbage Kimchi can be strong while a recipe using radish or cucumber will have a lighter taste. Kimchi can be used in Korean stews or with other ingredients. It can also be used to flavor the base of tofu stew. Others use it in scallion or seafood pancakes. This is because the brine helps to add flavor. 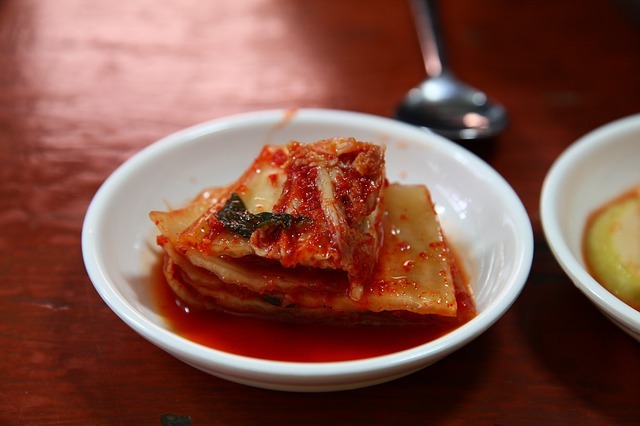 Kimchi is used to dress noodles globally. You can make a nice meal with just an egg and kimchi. You can also make ramen that is Kimchi flavored. Dressing your noodles with Kimchi will take your meal to the next level. You can use kimchi to add a kick to your fried rice. The flavor of kimchi will give the rice another flavor. The acidity in kimchi will make the dish more interesting. Kimchi can be added to various meals to give them a different flavor. It can be used with cheese sandwich, pizza, roasted Brussels, chicken salad, rice cakes, and others. Kimchi is a delicious burger topping. It can be used on a plain cheeseburger or on the patties with soy glaze that is sweet. The sweet soy will complement the spicy and acidic punch of the kimchi. You can also whip the kimchi, sesame oil, scallions, mayonnaise, and sugar. Kimchi can be turned into a multipurpose condiment. You can use an immersion ﻿blender to make a loose sauce that is similar to salsa sauce. The sauce is good for braised or grilled meat. Kimchi butter is well known for grilled oysters. You can make a dipping sauce for dumplings by using Kimchi juice, butter, gochujang, and honey. There are different types of kimchi that you can make at home. 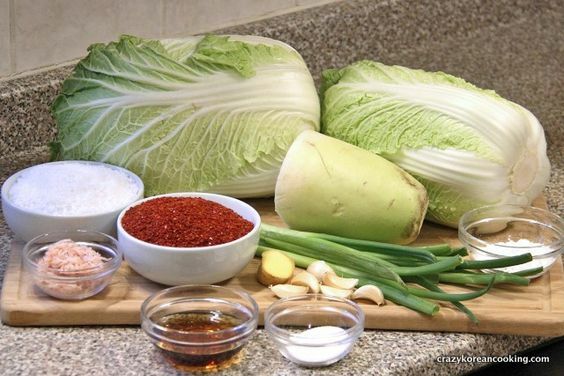 Most people know the Napa cabbage Kimchi. The following are some of the different kimchi that is not common. They are delicious and easier to prepare. This is also known as Baek-kimchi. When preparing this Kimchi, red peppers are not used. 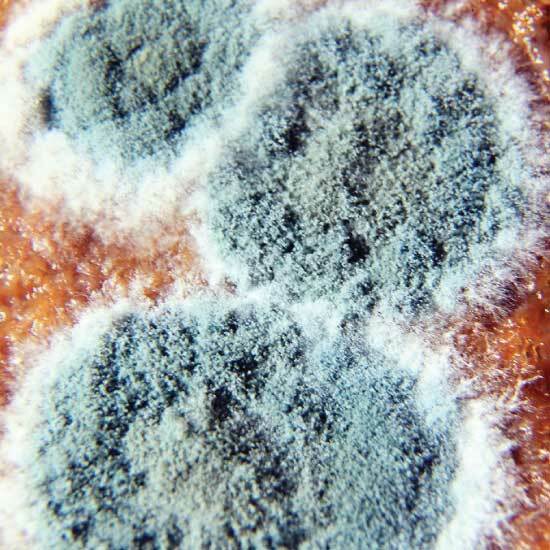 It can be eaten by kids, elderly people, people with stomach problems, and others. It can be served in parties. It is delicious and packed with various vitamins. It can help to a cold or flu that is stubborn. This is also known as the green onion kimchi. It is prepared with green onions that are slender and long. 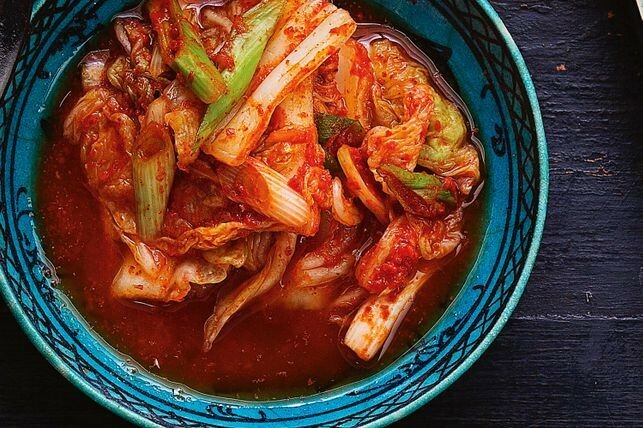 The onions give this kimchi a unique flavor and taste. The taste is great and unique. The onions also help to remove toxins from the fish, improves the digestive system, and improves energy. This can be served with makgeolli. This is not left to ferment. It is served immediately. This makes is an exception when compared to other types. It is dipped in salt or drizzled with soy sauce. It is a flavorful dish for those who love fresh and mild kimchi. It is also known as kkakdugi. It is made of radical radish. When preparing, the radish is cut into cubes. They pickled with a combination of preservatives for Kimchi. You can snag them with a spoon or chopsticks. You can serve this with dishes that are bland. This is because the flavor is sharp. The radishes used are smaller. They are dipped in flour porridge with garlic, red pepper flakes, and other ingredients. The mixture is then kept in the fridge to pickle. This is good for summer seasons. It is made of Chinese cabbage and radish that are finely chopped into small squares. They are soaked in a water bath with chili powder. The chili spices up the ingredients. This is ideal for summer and spring seasons. This is also known as Buchu kimchi. This should be served before it gets sour. Fermenting it for long will spoil the flavor. It is easier and simple to make at home. Kimchi is one of the most popular foods that is fermented. It can be used as a side dish for any dish. 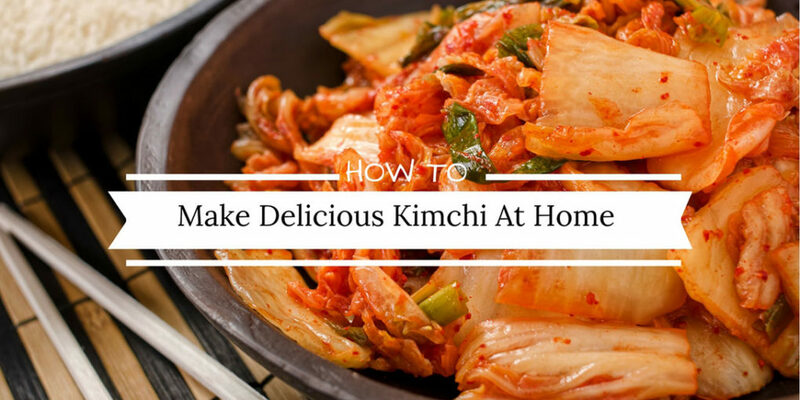 The following are some of the tips that can help you to make the best kimchi at home. Ensure that you decide the type of vegetables to use. you can just use cabbage or add other vegetables like onions, red peppers, carrots, spinach, mushrooms, or scallions. You will also need ginger and garlic that are fresh. other ingredients include spices, sugar, salt, red pepper flakes, spices, and any other spice or seasoning that you want to use. Clean the vegetables and prepare them. Cut off the cabbage core and cut the remaining cabbage into strips. Place the cabbage in the colander to drain for about 15 minutes. Cut the other vegetables into strips. The paste is made of ginger, garlic, sugar, onion, and spices. The red chili flakes can also be added. Anchovy sauce or fish sauce is also used. If you don’t have the sauces you can use the kelp flakes or the vegan fish sauce. All the ingredients are mixed in a blender, food processor, or in a bowl. Ensure that the paste is smooth. You can add water to achieve the desired consistency. Mix the vegetables, cabbage, and the paste together. Ensure that the vegetables are well coated with the paste evenly. You can wear gloves if your paste contains red chili pepper flakes. Pour your Kimchi into a jar. Ensure that it is tightly packed to prevent it from going bad. The vegetables should be covered by the brine. Leave about an inch space at the top for expansion during the process of fermentation. After packing the jar, cover it tightly and keep it at room temperature for about 5 days for the fermentation process. Check the Kimchi daily by pushing the vegetables using a spoon. You can place a plate under the jar. This is because brine may seep out through the lid. When the Kimchi is ready, keep the jar in the fridge. Ensure that the kimchi is not left too long to ferment. It will getter bitter. If you don’t use the whole Kimchi from a jar, ensure that the remaining is submerged fully under the liquid. To prevent the development of mold. You can make Kimchi vegan by substituting the fish sauce for the red miso paste. The other ingredients remain the same. There are different ways to prepare Kimchi at home. This depends on your preference and taste. There are different types of Kimchi that can be prepared. They are made of leek, cabbage, cucumber, cayenne peppers, scallion’s radish, ginseng, Indian mustard leaves, and garlic. The vegetables can be mixed with seasonings and spices. They are fermented for some days under some conditions. This is made by fermenting vegetables in a sauce that is tangy and spicy. Cut the cabbages into small strips of about 2.5cm. Put the cabbage in a bowl and mix with a tablespoon of salt. Set it aside to drain for about one hour. Blend the grated ginger, garlic, fish sauce, sugar, chili sauce, and the vinegar together to make your Kimchi paste. Use cold water to rinse the cabbage. Drain it to dry. Put the cabbage in a large bowl and add the paste, carrot, radishes, and onions. You can serve the mixture immediately or put it in a jar and leave it to ferment for about 24 hours or more. This kimchi can be kept in the fridge for up to 14 days. Remove the stem of the cabbage and slice the cabbage into about 2-inch slices. Dissolve salt in a bowl with water. Put the cabbage in a bowl. Pour the salted water and toss. Soak the cabbage for about an hour. Turn the cabbage and continue soaking for about another one hour. Rinse the cabbage well and set it aside to drain. In a sauce pot, place the mushroom, pumpkin pieces, and the sea kelp. Pour enough water to cover them. Boil and simmer for about 20 minutes. Take the pot from heat and let the mixture cool. Discard the vegetables and reserve the liquid. You can reserve ½ a cup and freeze the remaining stock for future use. Put the cut potatoes, garlic, onion, ginger, persimmon, and pour in ½ cup of the stock. Blend them until the mixture is smooth. Add the diced red chilies and blend to chop them into small pieces. Pour the puree into a mixing bowl and add soy sauce and the chili flakes. Mix them well. In another bowl, mix the cabbage and the onions. Add sesame seeds and 2/3 of chili filling. Wear gloves and toss using your hand. Ensure that everything incorporates with chili filling. Put the Kimchi in a container that is airtight. Allow it sit for about 2 days at room temperature to ferment. When ready, you can use it immediately or keep it in the fridge. Use clean water to wash the vegetables. Measure all the ingredients you have and ensure that everything you need is ready. Place the cabbage in a bowl. Preserve the large leaves. Sprinkle the cabbage with 2 tablespoons of salt. Mix well to combine. Cover the cabbage and set it aside at room temperature for about an hour. The cabbage can release up to ¼ cup of liquid as it wilts. Mix chili pepper, ginger, garlic carrots, chili pepper, and sugar in the blender. Blend the mixture until you get a paste that is rough. This can take about 30 seconds. Scrape the sides well. Drain the cabbage and set the liquid aside. Dry the leaves by patting. Mix the cabbage with the paste to make your basic Kimchi. Pack the Kimchi in the mason jars. Add an equal amount of liquid in the jars. Leave at least an inch space from the top. The Kimchi should be covered completely by the liquid. Use a wooden spoon to press the ingredients down. Cover the jars with the remaining cabbage leaves that you reserved. Cover them loosely and allow them to sit at room temperature for about 5 days. You can taste the Kimchi daily until you it achieves the desired taste. When ready, it will taste sour and spicy with sauerkraut-like texture. 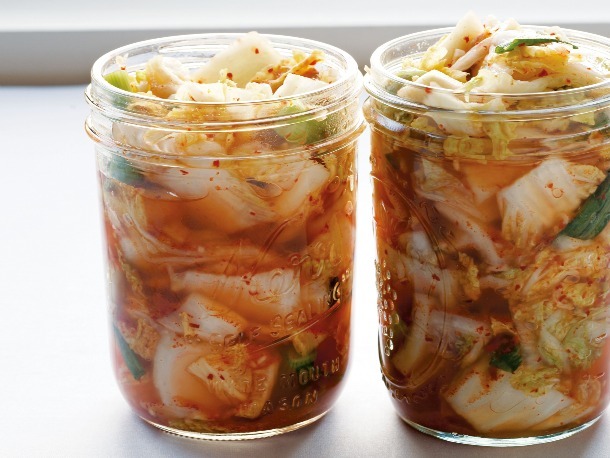 When the kimchi is ready, remove the covering cabbage leaves and store the jars in the fridge. It can last for several months in the fridge. There are different ways on how to make kimchi at home. This recipe is easier and simple. 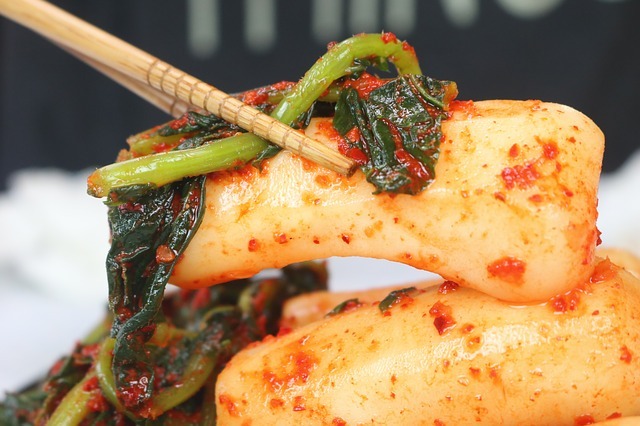 If you are making Kimchi for the first time, you can try this recipe. This recipe will give you about two 12-ounce jars. Chop the cabbage as you want. The strips can be thick or thin. Chop the scallions and radishes. Put the vegetables in a bowl and add salt. Toss to mix well. Let the mixture sit for about 2 hours. The salt will help to draw water out. If you don’t have time, you can crush the vegetables and squeeze the liquid out with your hands. Blend the chili flakes, ginger, and garlic in a blender until you get a paste. In a bowl mix the cabbage, scallions, radish, and the fish sauce with the paste. Wear gloves when mixing the ingredients to protect your hands. Pack the mixture in the mason jars. Press the mixture well in the jars until the liquid rises. Leave about an inch space from the top. Cover the jars and leave them at room temperature for about seven days. You can open the jars daily to release the gases formed during the fermentation process. You can also drain some water if the level rises. Pack the vegetables under water using a stomper or your hands. Taste the kimchi daily until you get the desired sourness. When ready, keep the jars in the fridge. The Kimchi can last up to six months. This Kimchi can be fermented or eaten fresh. it can be served with noodles to meats. In ½ gallon water, dissolve a cup of salt. Soak the cabbage in the salted water for about 4 hours. Mix ginger, fish sauce, and garlic in the blender. Combine the cut green onions, radish, garlic mixture, a tablespoon of salt, chili powder, mustard greens and some sugar if you like. Toss the mixture well. If you are using your hands, wear gloves to prevent your hands. Take the cabbage out of the water and rinse it well. Drain it in a colander. You can squeeze the excess water as much as possible. Stuff the radish mixture in between the cabbage leaves. You can start with the largest leaves and finish with the smaller leaves. The mixture should fill the leaves adequately. 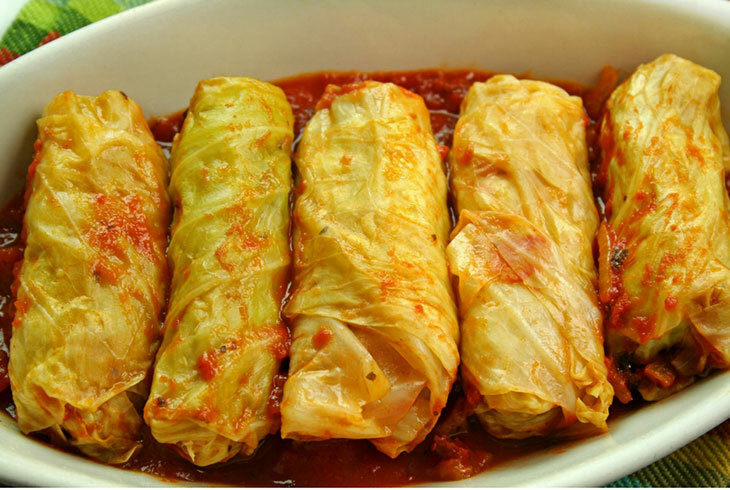 Take a large leave and wrap it around the cabbage tightly. Divide the cabbage into four 1-quart jars. Press them down to release any gas. Keep them at room temperatures for about 3 days before you serve. Take the Kimchi out and slice them into small pieces, about an inch. If you don’t want it to ferment, sprinkle it with sesame oil and seeds before you serve. Keep the jars in the fridge. Kimchi can be eaten for up to three weeks. If it gets too fermented, you can use it to make flat cakes, hot pots, fried rice, or dumplings. Remove the outer leaves of the cabbage and set them aside. Cut the cabbage in quarters and remove the inner core that is tough. Slice the cabbage into small slices about ½ -inch. Put the cabbage in a colander and sprinkle with salt. Mix well. Place the colander over a bowl and let the cabbage drain for about 2 hours. Mix the sugar and vinegar in a large bowl. Stir to dissolve the sugar. Add garlic, scallions, ginger, and chili paste. Stir the mixture well. Rinse the cabbage with clean water several times. Let the cabbage dry before adding it to the vinegar mixture. Transfer the mixture to a jar and enough water to cover the mixture. Cover and store in the fridge for about 4 hours. You can serve this kimchi immediately or let it sit longer. 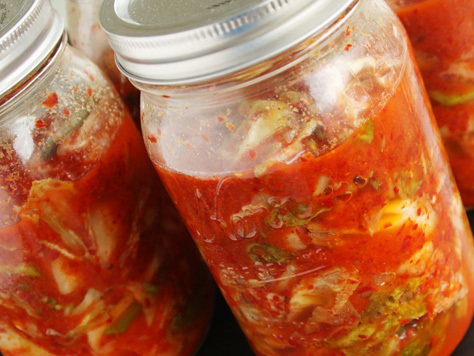 Consuming excess Kimchi can affect the digestive system. Too much Kimchi can lead to gastric cancer. This is because Kimchi contains a lot of fiber which may produce a lot of gases and bloating to some people. Those suffering from high blood pressure and cardiac problems should be careful when consuming Kimchi. This is because Kimchi it contains high concentrations of salt. If you are suffering from any condition, ensure that you contact your professional doctor before you consider consuming Kimchi. 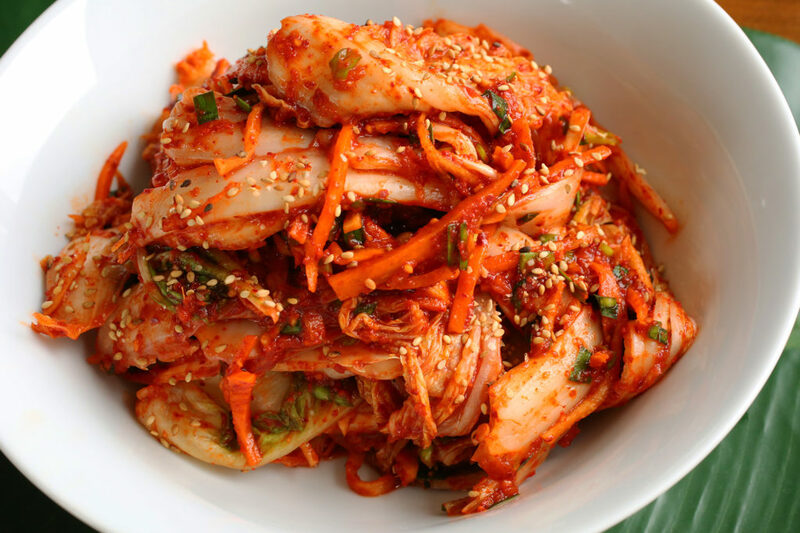 Kimchi has high fiber, low-calorie, and it is packed with nutrients. 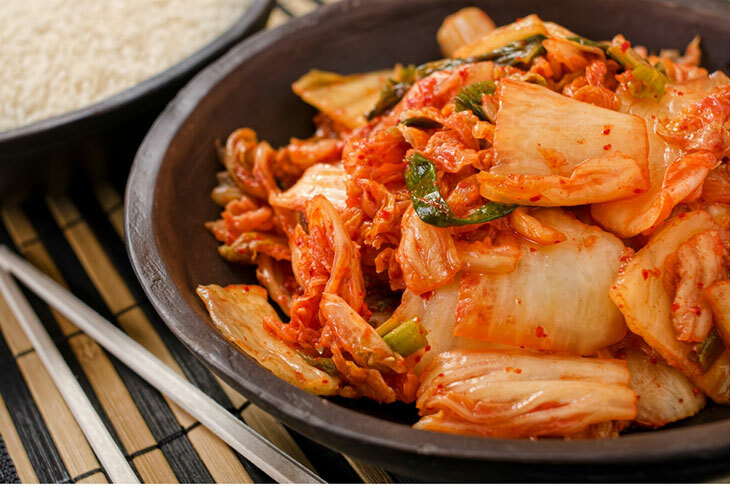 Kimchi contains a wide range of vitamins, amino acids, antioxidants, minerals, and other important components. Kimchi has health benefits. It improves the health of the heart and the digestive system. It contains antioxidants which help to reduce conditions like obesity, diabetes, cancer, gastric ulcers, and atopic dermatitis. The probiotic and flavonoid in the Kimchi help to combat aging, maintain cholesterol levels, and strengthens the immune system. 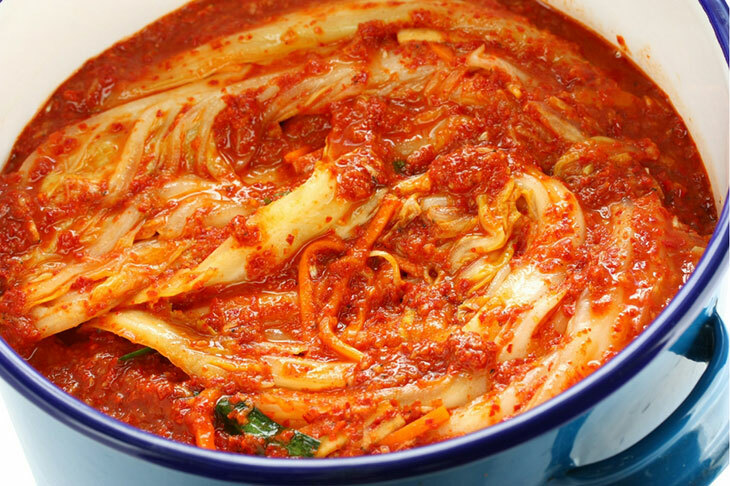 Kimchi helps to promote digestion. Healthy bacteria are created during the fermentation process. this keeps the intestinal flora healthy. 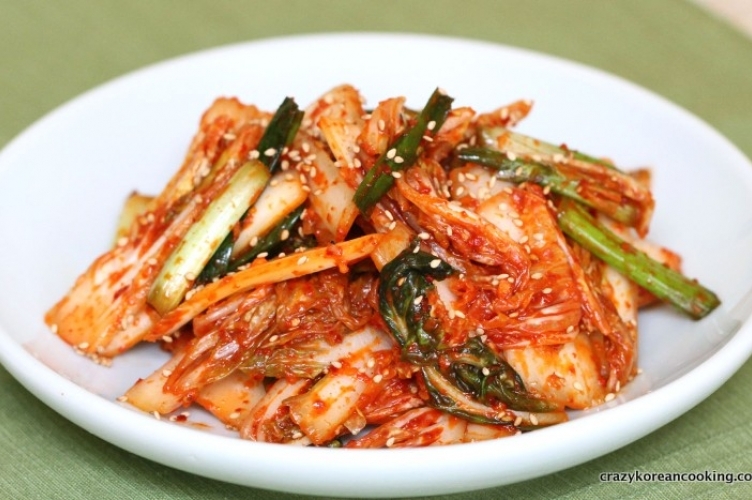 ​Kimchi helps to regulate the cholesterol level. When the cholesterol level is lowered, it prevents the risk of cardiac disorders. ​The antioxidants properties offer protection against the oxidative damage. The body is also shielded from any harmful effects of free radicals. ​Kimchi contains a bacterium that helps in weight loss. It controls the appetite and reduces the sugar levels. The fiber content will keep your body full for a long period. Kimchi is packed with several nutrients which helps to improve the immune system. The nutrients can fight infections and cure flu and cold symptoms. ​The antioxidants and vitamin C in the kimchi gives it the anti-aging properties. This reduces the inflammation that leads to aging. It can help to reduce the risk of cancer. This is because it contains anti-cancer properties. 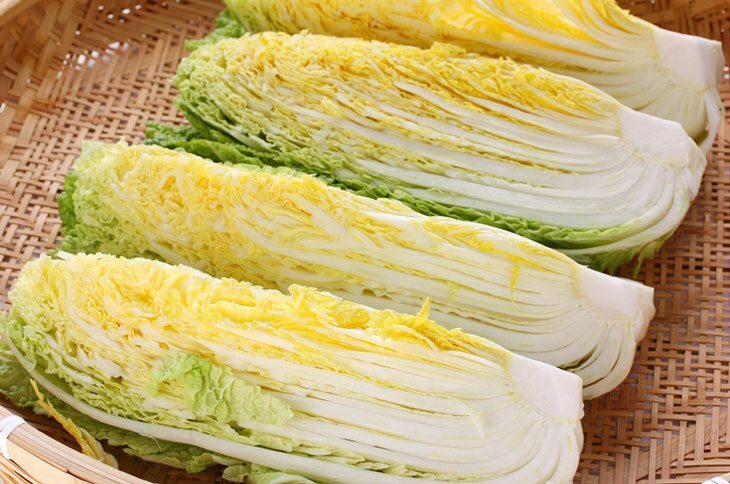 The cabbage used in preparing Kimchi contains flavonoids which help to prevent the growth of the cancer cells. ​It helps to treat diabetes. It has proved to be more useful for the diabetes patients. It contains anti-bacterial, anti-mutagenic, and anti-carcinogenic properties. 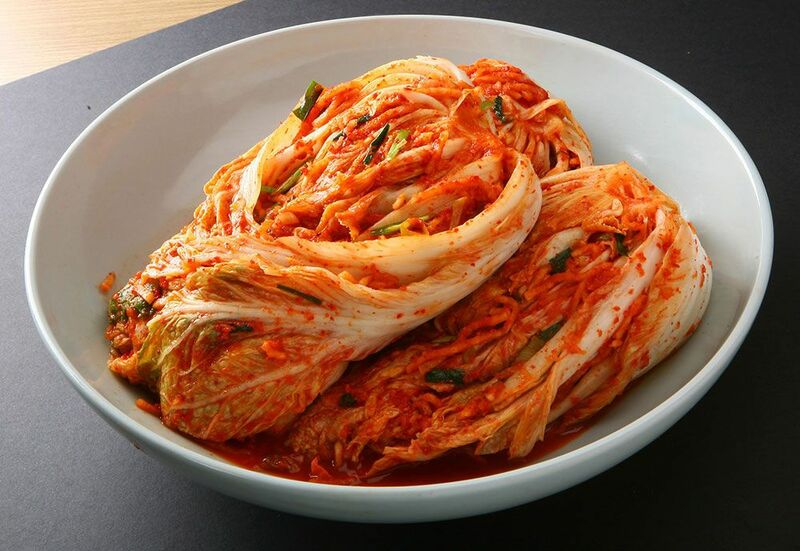 ​The healthy bacteria and the strong antioxidants in Kimchi help in the production of collagen. ​This improves the skin elasticity, delays aging and promotes a youthful skin. 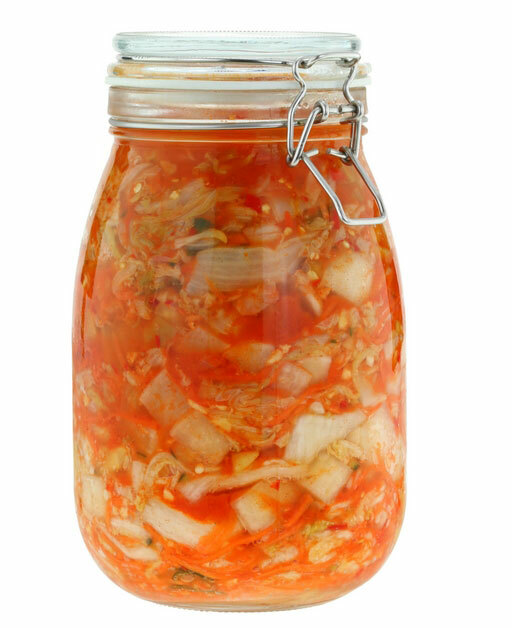 Lactobacillus bacteria in kimchi prevents yeast infections. It combats nutrient depletion, builds stamina, and it is a nutritious condiment. 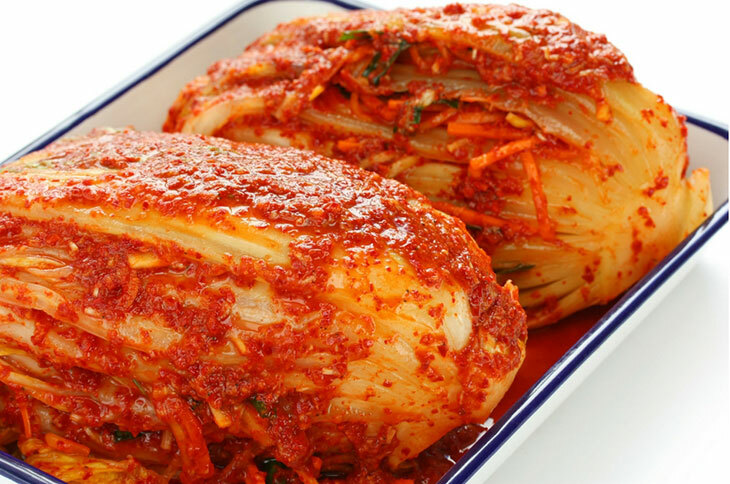 The main vegetables used when preparing Kimchi are cabbage, ginger, and garlic. Others are radishes, carrots, and green onions. Spices give the kimchi a unique feature. The main spice in most Kimchi recipes is the red chili flakes. The paste can be made of garlic, ginger, and chili flakes. You can use rice flour as a starchy base when mixing with vegetables. A starchy base is not a must. Vegetables, paste, and spices are ﻿the main basics when making kimchi at home. In most recipes, veggies are soaked in brine for more flavor to infuse. Other ingredients include a little sugar, anchovies, fish sauce, mushrooms, and other vegetables. Storing kimchi well is important. this is because it is pungent. Kimchi is kept is kept in the fridge. This helps to contain the live culture. The natural flavor is retained when kept in the fridge even after several months. Kimchi can also be kept at room temperature for few days. The kimchi may not be palatable for those who have sensitive stomachs and noses. There is no need to transfer unopened packs or bottles of Kimchi to another container. Just keep them in in the fridge. The opened containers of Kimchi should be transferred to a container that is airtight. This will prevent the kimchi aroma from leaking out. Use hot water to sterilize the containers before storing your Kimchi. Spoon the Kimchi into the dry jars and leave an inch space from the top. Cover the jars using a cling wrap and then with the lid. Indicate the storage date and stick on the jars. You can also use resealable bags to store the homemade Kimchi or leftovers. Seal the bags and place them in a plastic bag that can be resealed. You can double the bags to contain the Kimchi’s odor that is pungent. You can keep an opened bottle in the fridge for about three months. The unopened container can last up to 12 months or more in the fridge. Ensure that the temperatures are low and constant. Double dipping will shorten Kimchi shelf life. It is hard to tell when Kimchi has gone. This is because if food is fermented it is already bad. If the vegetables are mushy or the juices start to bubble. If the kimchi is too sour and has ripened, it can be used still. This will depend on your taste. Kimchi that is moldy, is not safe for consumption. Discard it immediately if you don’t like the taste or odor. Kimchi is simple and easier to make at home. It is nutritious and delicious. It has several benefits for the body. It can be served and used in different ways. 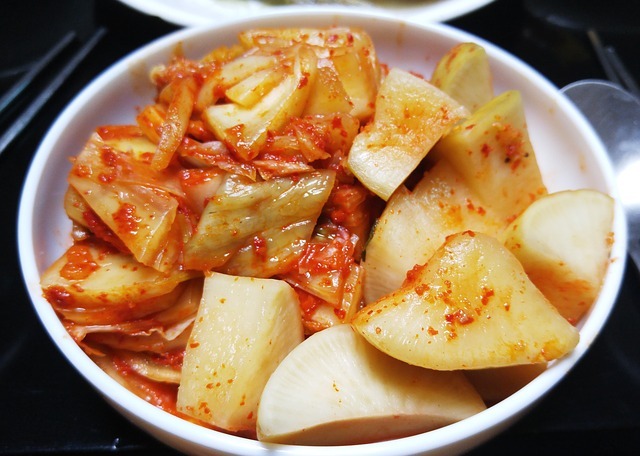 There are different types of Kimchi that you can prepare at home. You can use any recipe to prepare a delicious Kimchi. You can prepare the Kimchi at home and enjoy it in many varieties. You can add it to stews, soups, or dishes with rice. Kimchi can be served as a topping on pancakes or sandwiches.